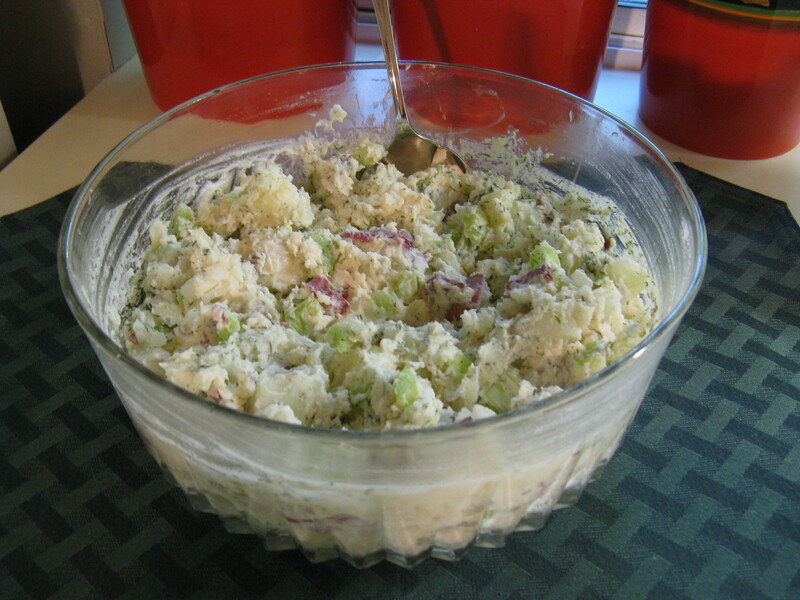 Now that summer is almost here and we are grilling more, I love to make a cool and creamy potato salad to accompany whatever we’re having. 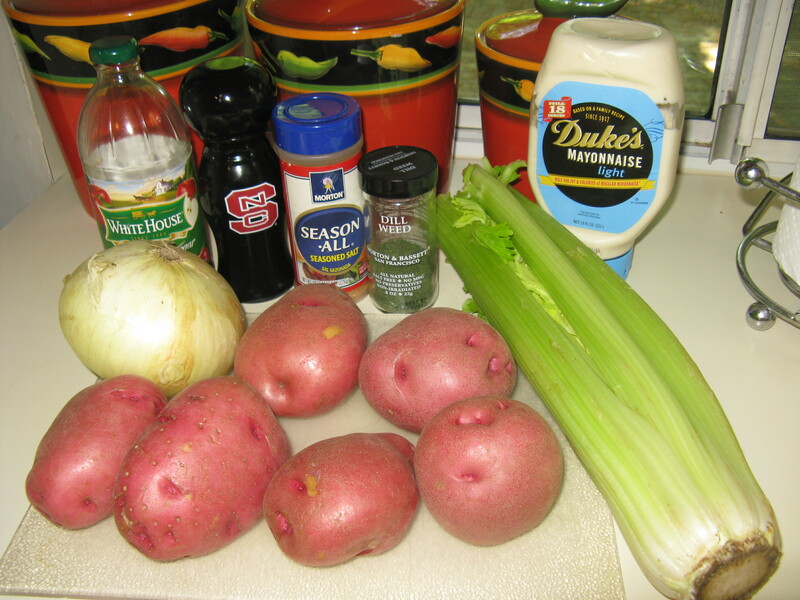 I’m not a big fan of egg or mustard in my potato salad, so I keep this one simple and just add celery, onions, mayo, vinegar, dill weed, salt and pepper to red skinned potatoes, with their skins intact. Scrub potatoes well and cut into bite-sized pieces. Add to a big pot of salted boiling water and simmer for approximately 25 minutes, until fork tender. Drain thoroughly, and place in a large bowl. Toss with 2 tablespoons of the vinegar, and refrigerate until cool. Once the potatoes are cool, I usually cut them into even smaller pieces, and discard any of the skins that have come loose. I then sprinkle them with the remaining vinegar. Add the diced celery and onion, and mix together. Add the the mayo, dill weed, salt and pepper and mix well. Refrigerate for at least an hour before serving. This goes great with burgers, black bean burgers, hot dogs, sandwiches or as shown here as part of a traditional Easter dinner with ham and the rest of the trimmings! 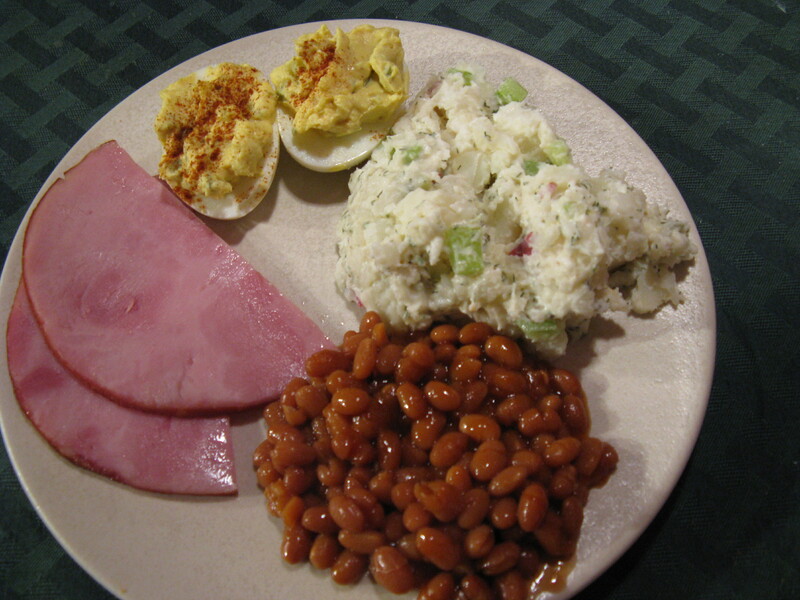 This entry was posted in Recipes and tagged eat drink and be merry, food blog, Kel's cafe, Kelley Chisholm blog, potato salad, potato salad recipes, Raleigh food blog, vegetarian. Bookmark the permalink.